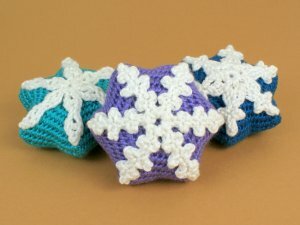 The snowflakes are especially designed to fit perfectly as appliques on the star when made with the same weight of yarn and hook, to create a dazzling and completely original tree ornament. Match the star's colour to your holiday decor! Size: approx 4" (10cm) diameter when worked in worsted weight yarn. Or you can size it down by using finer yarn and a smaller hook! Date Added: 11/29/2015 by Alicia B.